The Wadebridge Yardmaster, Bill Truscott, has been making extensive enquiries about the mysterious horse box belonging to Sir George Widgeon. Doncaster, that arrived at Trepol Bay in a special train, including the CLPG's preserved (in SR livery) ex-LBSCR brake van now used for enthusiasts. Also included in the train was one of a batch of surplus non-vacuum-braked (but fitted with through air piping) BR Grey Ferry Tube wagons sent to help cope with the increasing goods traffic resulting from the activities of the Association for the Promotion of Cornwall's Railways. As long as there is a fitted head of vacuum-braked wagons in the train, these wagons can be usefully placed in service in the area. From his enquiries, Bill Truscott has discovered that there was a very good reason for the transport of the mysterious horse box via the S&D, the SR mainline to the West and the North Cornwall line to Wadebridge, as far as possible during hours of darkness. It seems that the horsebox contains a very valuable young racehorse that Sir George, who has very good contacts within BR SR, wanted to remove from scrutiny. Sunday evenings usually offer the opportunity to relax and what better way to do that than running a few trains and enjoying a glass of wine. I do believe that the Manor and Grange make a perfect combination working together and I have to say that they perform beautifully around my little circuit at the head of a train of vans. Praries of both large and small varieties complete the scene. Excellent photo., Martin, and I fully agree with you about the loco. pairings. 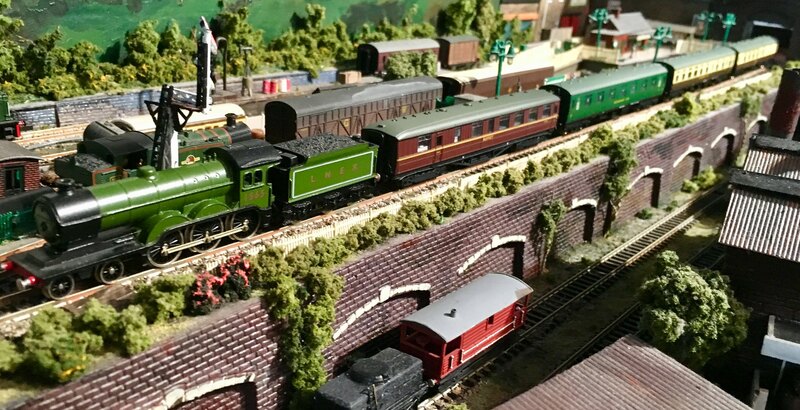 I can copy that double-header of a GWR livery "Manor" and BR Lined Green "Grange". Maybe, tomorrow, if we have some sun. Sounds tip-top to me, Martin. And that's a super photograph; thank you very much. 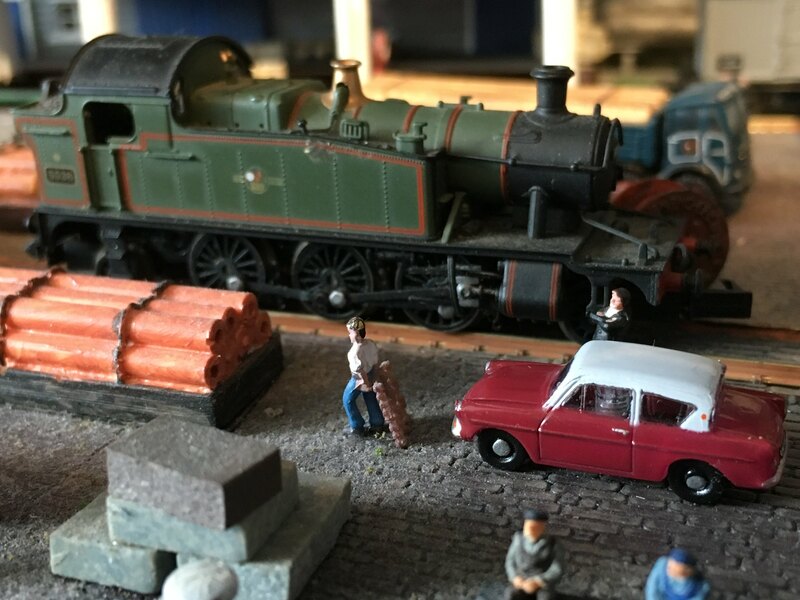 Wadebridge yardmaster Bill Truscott has bought a brand new Ford Anglia of which he is extremely proud. He’s taken the opportunity to motor over to Trepol Bay, his excuse being to witness the use of a prarie tank around the harbour. In reality, however, Bill wanted to show off his new car. Unfortunately, no one appears to be particularly interested at the moment. Maybe the young lad with the pallet will be back to have a look once he’s delivered it. Many thanks for this photo., Martin. A 4575 is a very rare visitor to Trepol Bay Harbour. Perhaps it was on 'gauging trials' as part of the enforced BR SR and BR WR co-operation or even with Easter weekend enthusiast brake van tours in mind and that was the excuse that Bill needed to make a short trip in his brand new car? Bill suddenly realised that he really needed a car and got a very good deal at the Ford dealership in Penmayne, especially as, thanks to years of savings, he was able to pay by banker's draft. Banker’s Draft - now there’s a blast from the past. Today has been busy, food shopping, a short session at the allotment, a trip to the local dump and then a full wash and polish of our camper - Bertie. 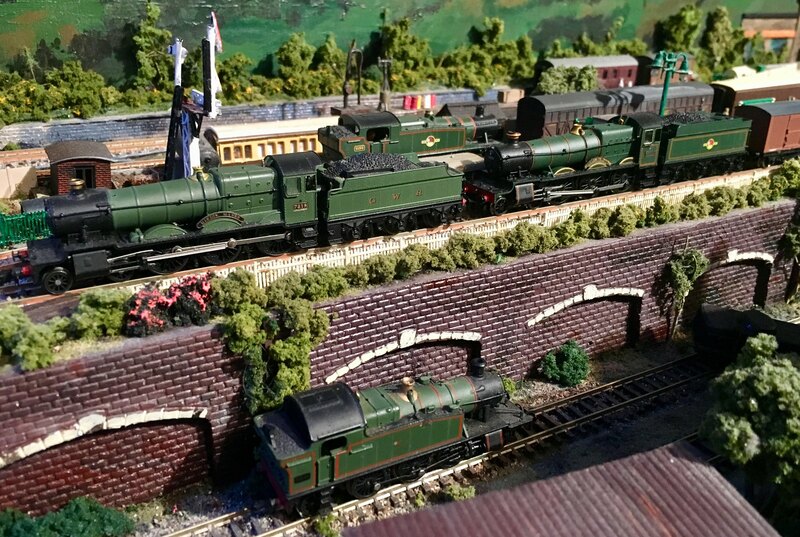 However, relaxing with a foaming ale early this evening (sorry to steal your description John), I was having a chuckle at a post on another online platform about unusual or bizarre locomotive/train formations which might annoy the purists. As a consequence, I thought it might be fun this evening to see what I could come up with. So.......here’s the result. A somewhat super-powered branch auto train makes rather heavy work of the approach to Trepol Bay. Another diesel failure; thank goodness for steam engines! For some reason, and I know not why, I rarely run my my two ex GW 4-6-0s of Grange and Manor Classes. However, this evening was an exception and I’ve had a most agreeable hour or so running the pair on various trains around my little Trepol Bay layout where they performed admirably. So….somewhat unusually, we go back in time to Spring 1939 and witness 7819 Hinton Manor at the head of a short train of mixed vans heading towards Wadebridge on a fine sunny day. What a fine sight Mr. Collett’s 4-6-0 makes as she passes slowly by. 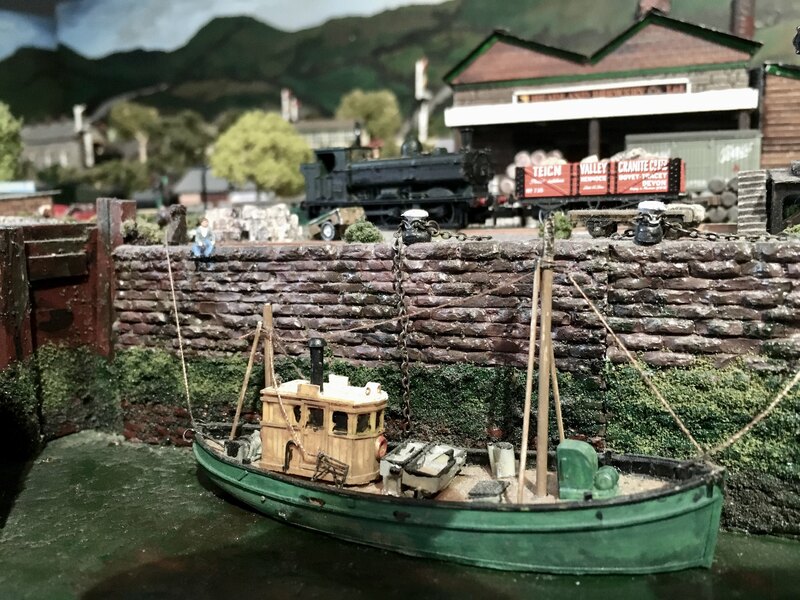 A short while later a somewhat work stained pannier shunts a single private owner wagon from the Teign Valley Granite Company along one of the harbour sidings. A small trawler is awaiting high tide before venturing out into the Atlantic in an hour or so whilst a member of her crew is taking a well earned short break on the harbour wall. Thank you, Martin, for two more excellent photos. I agree with you about not seeing the "Grange" and "Manor" often enough, particularly, the "Manor". 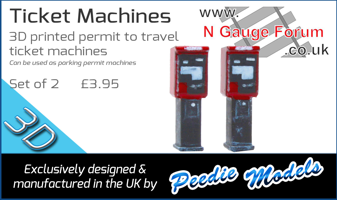 "Manors" are frequent visitors to Cant Cove working WR trains via Bodmin Road and Wadebridge to Penmayne. "Granges" far less so, as they are barred west of Cant Cove. This afternoon, preserved ex LNER number 1565 makes a fine sight passing Trepol Bay with the slightly late running Easter Monday Dining Special which ran from Penzance to Exeter via Port Perran and the North Cornwall line. The B16 was running well at the head of a very mixed rake of stock. Passengers were treated to luncheon and afternoon tea during their journey as well as fine wines and ales from various Cornish breweries. 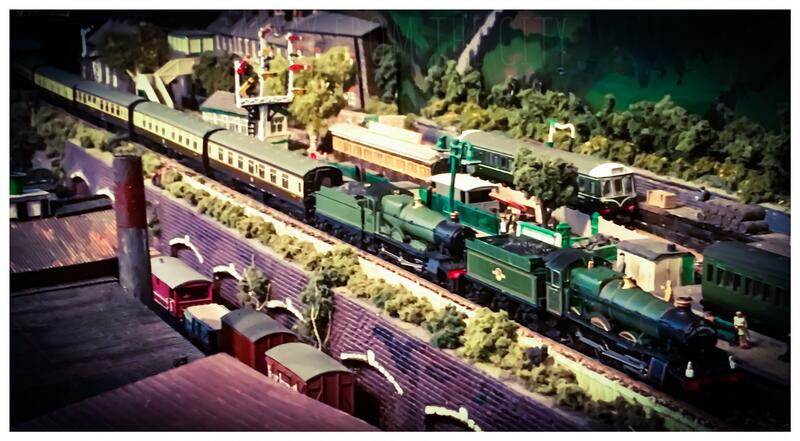 Here’s a close up of Mr Holden’s 4-6-0. She is , of course, from the Union Mills stud of locomotives which are renowned for their reliability, durability and sheer pulling power.